April | 2016 | Footwear Fashionista … a sneak peek into my shoe closet! You can’t judge a book by it’s cover, and these shoes prove just that. Nunc. 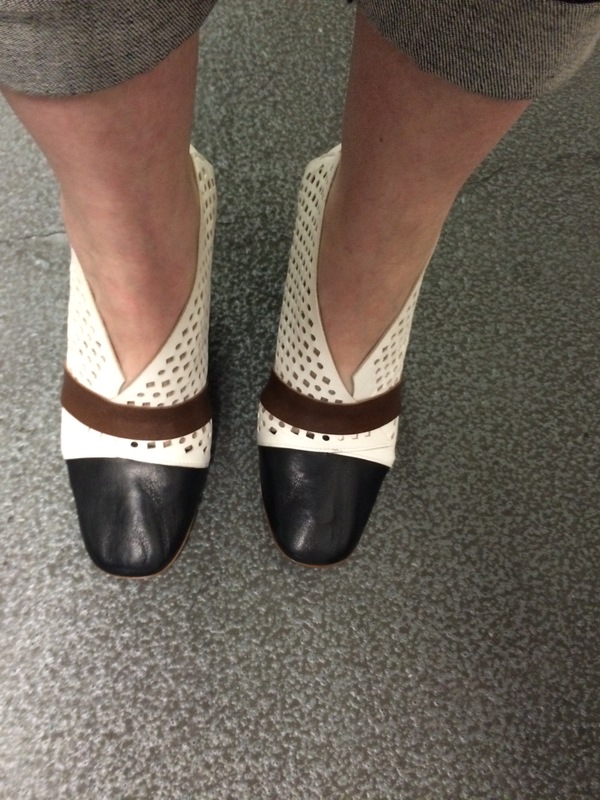 Named from part of the Latin expression Hic et Nunc, meaning Here and Now, these shoes are just that. The subtle, yet eclectic mix of details are what drew me to purchase this shoe, designed by Dominika Nowak. Her shoes source materials made in Italy but the shoes are hand-made in Poland. The blending of European cultures has created a shoe collection that definitely makes a statement. The “Lena” is all about contrasts. 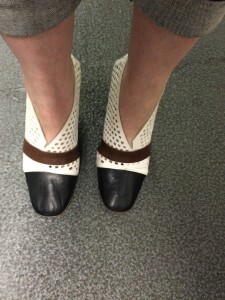 The smooth black leather contrasts with white trim, initially giving the shoe a sporty look. 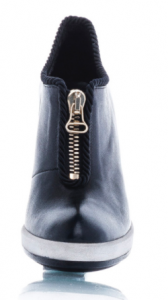 A front zipper showcases an edge, yet the braided trim gives it a Parisian-couture, polished elegance. A plain stiletto heel….um, no. This is a serious killer heel! But the details don’t stop there, and continue into the interior of the shoe and how its built and finished with mesh lining. 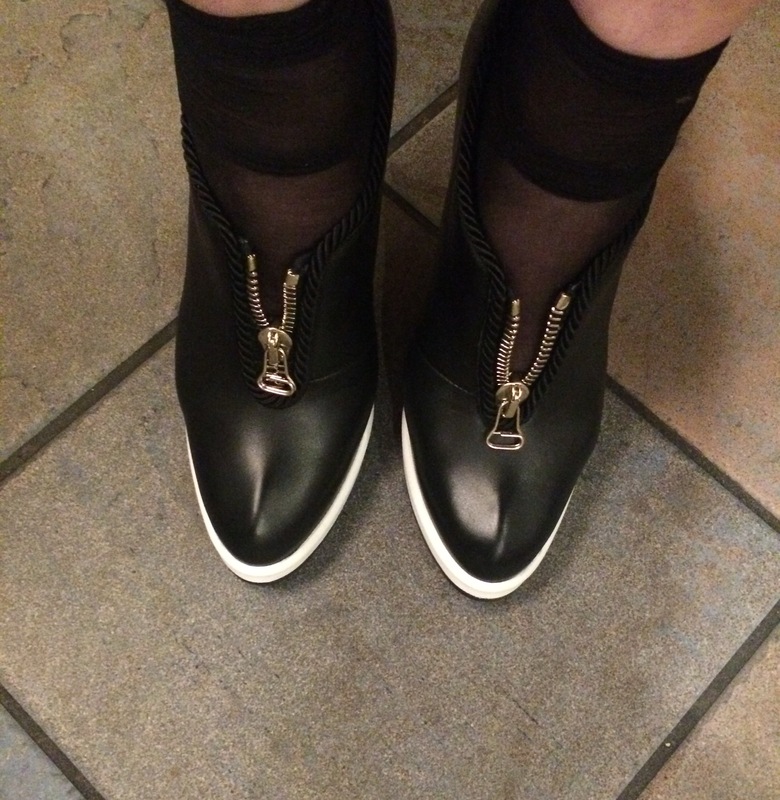 This shoe is everything … and then some. It’s my birthday this week, so I felt compelled to indulge. Delicious Shoe, a Chicago-based shoe store in a truck, opened a brick and mortar store called Sfizi, which means: the Italian colloquial term for things you desire, when struck by a craving, whim or fancy. There’s a term for my addiction! I visited the store and of course walked away with not one, but two pairs of kicks. After all, it is my birthday. I love the uniqueness of these shoes. By IXOS, an Italian brand, I would name these … Bellissima! 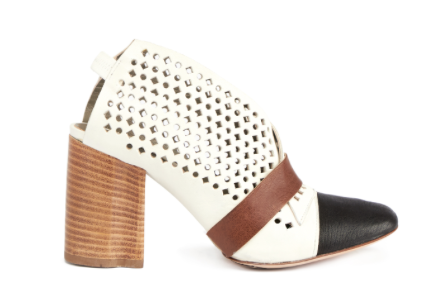 Off-white perforated and asymmetrical cut leather with black cap toe, separated by a brown leather band. 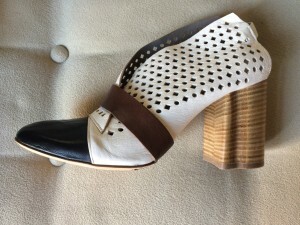 A sling back with a 3.25″, carved wooden, wide-block heel makes these shoes per morire per.